Now appears to be the best time to purchase a Bosch 18V cordless tool. 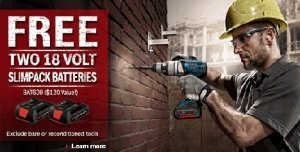 Bosch has come out with a new promotion where you can get Two FREE SlimPack (BAT609) batteries if you purchase a new Bosch 18V Lithium-ion tool or the PowerBox 360 radio. The offer excludes bare tools and reconditioned tool purchases. This promotion runs from April 15 to June 16 2012. Amazon is still running the promotion I posted a few days ago. Select Bosch 18V and 12V tools purchased from Amazon come with bonus free Amazon gift cards. You can get $15 or $25 gift cards by purchasing select Bosch 12V max tools, or $25 or $50 gift cards on select Bosch 18V tools.